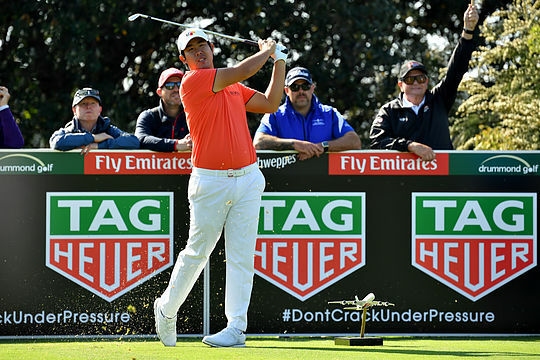 PGA Tour player Byeong Hun An has stolen the limelight away from the locals on day one of the Australian Open in Sydney. The World No. 51 took full advantage of the benign morning conditions at The Lakes to secure a 5-under 67 and leads by one shot from Matt Jager and Victorian amateur David Micheluzzi. An was thankful that he was able to get into the clubhouse with a low score before the weather changed for the worst. While An’s name would be a mystery to all but the most ardent golf fan the South Korean has what it takes to win, securing the European Tour’s BMW PGA Championship in 2015 by six strokes and finishing runner-up in two playoffs on the PGA Tour at the 2016 Zurich Classic of New Orleans and again this year at the Memorial Tournament won by Bryson DeChambeau. The 27-year-old also finished runner-up to Dustin Johnson at the Canadian Open in July. It seems it is only a matter of time before he once again hoists a trophy. In a six-way tie for 4th place at 3-under is Mexico’s Abraham Ancer, Cameron Percy, Marcus Fraser, Dimi Papadatos, Adam Stephens and Blake Proverbs. Ancer, a Web.com Tour graduate, finished 60th in the PGA Tour’s FedEx Cup standings last season with US$1,676,695 in prizemoney from 5 top-10 finishes. Pre-tournament favourite Cameron Smith kick-started his first tournament of the Australian summer in disappointing fashion carding a 2-over 74 and will need to have a very good Friday if he is to play the weekend. “It (the condition of the greens) was a weird mix. Usually the course is quite firm when it’s that windy, but for some reason…it was quite soft. I couldn’t get anything to the hole from the fairway,” said Smith, who will be teeing it up next at the World Cup alongside Marc Leishman. Defending champion Cameron Davis was another Aussie feeling the pain. Following an opening hole quadruple-bogey after finding the water, the 23-year-old managed to steady the ship and limped home with a 4-over 76. Conditions are expected the stay the same for tomorrow’s second round and will likely see some major changes at the top of the leaderboard for the afternoon groups.